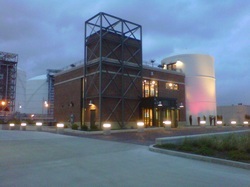 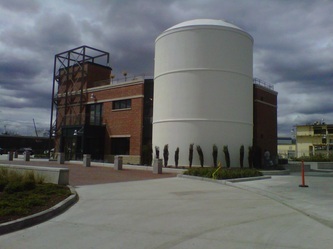 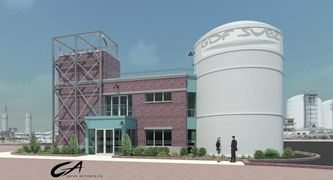 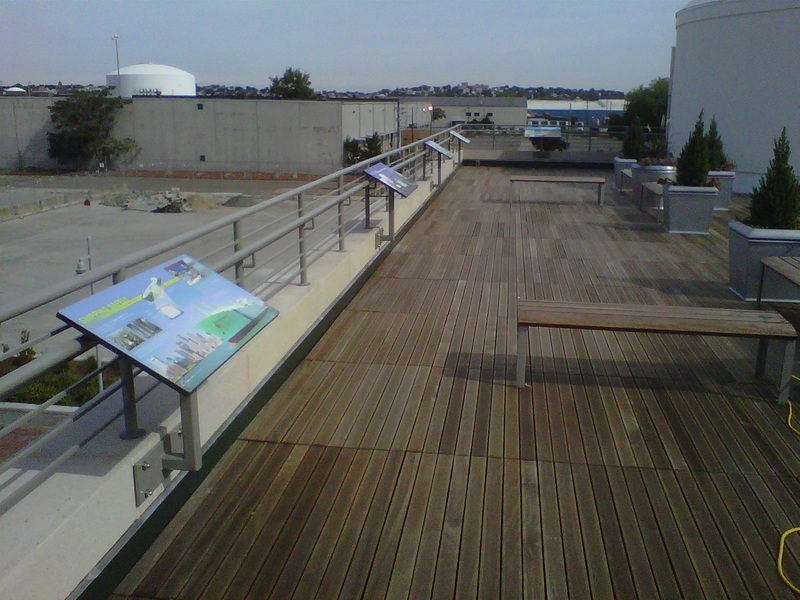 Corporate - Ganek Architects, Inc.
Distrigas of Massachusetts is a division of Belgium based GDF Suez Gas NA. 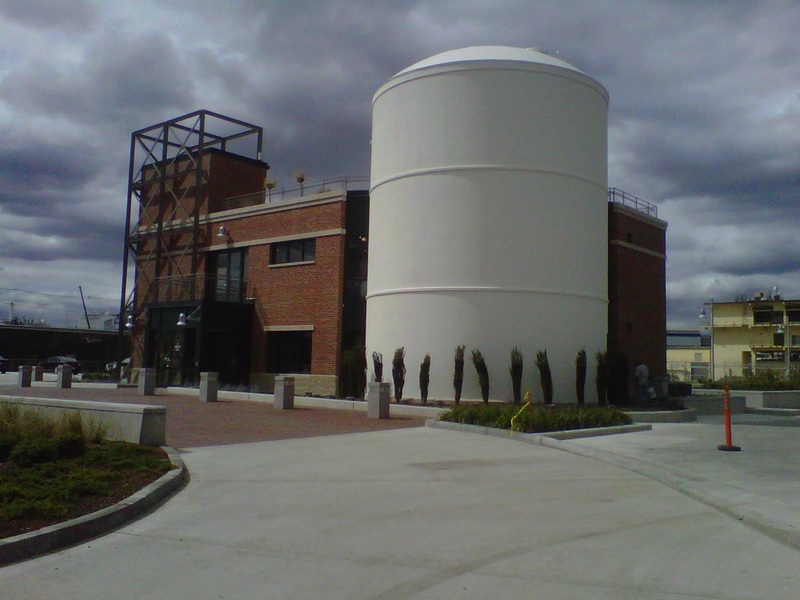 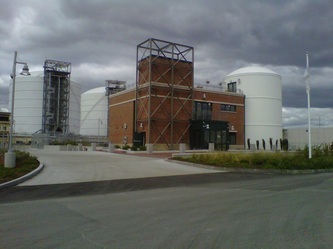 Located at the Everett Marine Terminal, Distrigas operates the longest servicing LNG import and re-gasification facility in the United States. 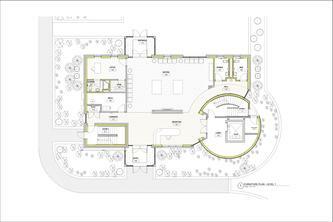 GAI was asked to design a 6500 SF Visitors' Center to accommodate tour groups of company officials as well as local and foreign dignitaries. 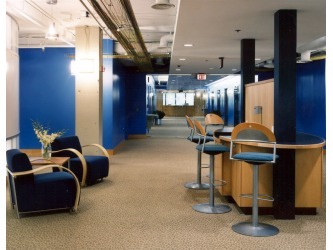 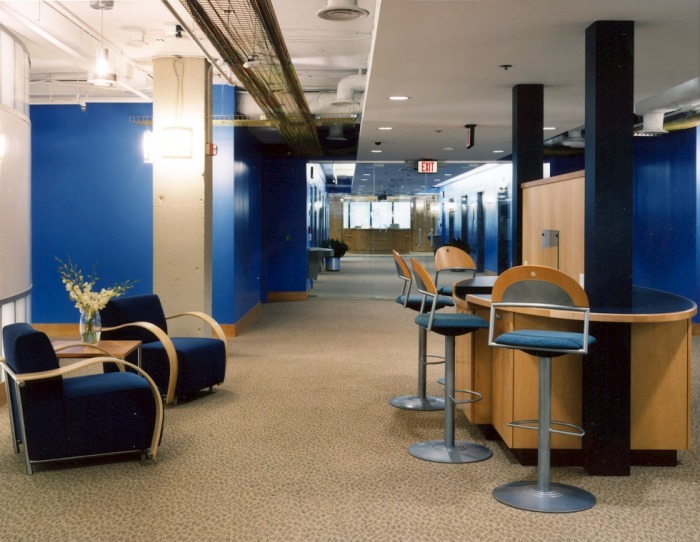 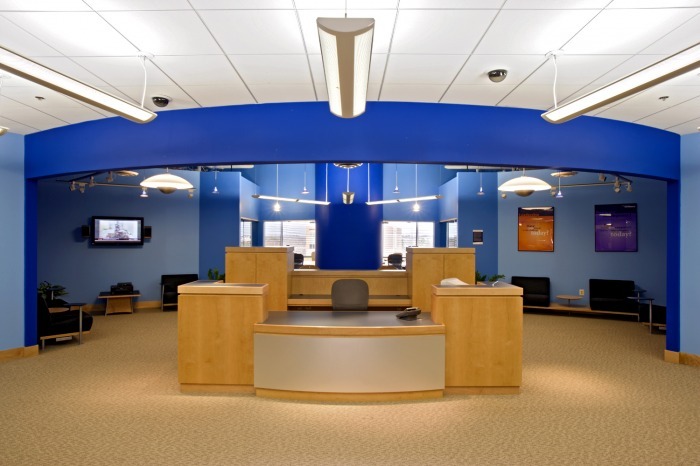 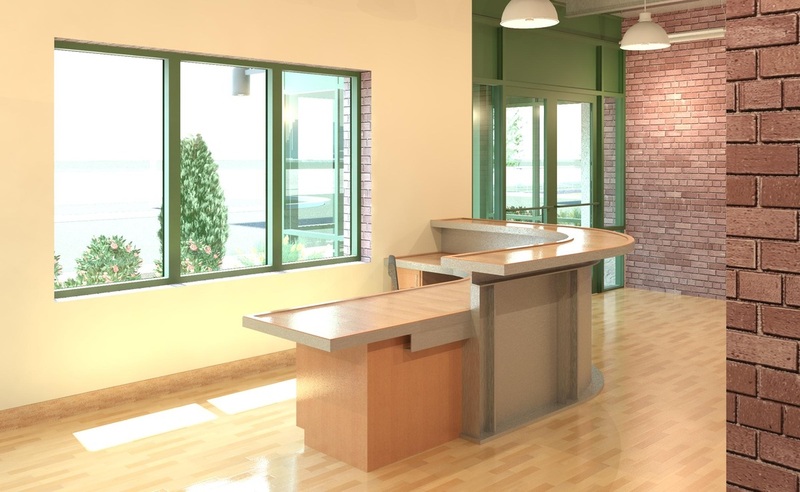 The building includes a reception/lobby area where visitor's are greeted and introduced to corporate security; a large conference room providing meeting and training facilities; and a large roof deck offering dramatic views of the Distrigas campus as well as the Boston skyline. 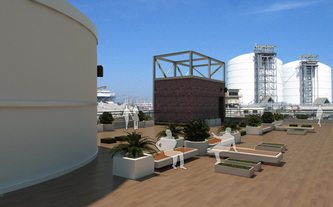 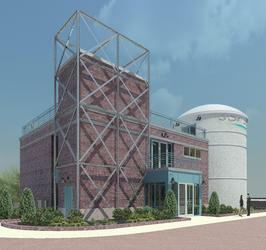 The building's imagery includes references to the large LNG tanks and their exposed steel gantries that are just yards away. 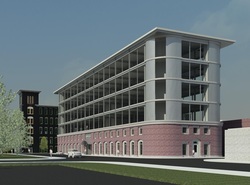 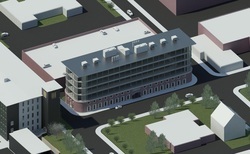 The new building sits on the 200,000 SF site of a former warehouse. 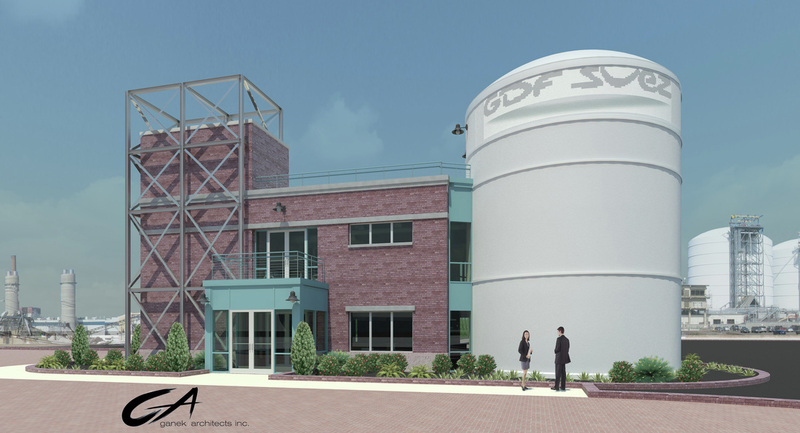 Upon completion of the full landscape design (Radner Design Associates, Landscape Architects), where once stood a rusting nearly 5 acre industrial building, will grow rolling mounds of native grasses and flowers, a green oasis in the midst of the historically heavily industrialized site. 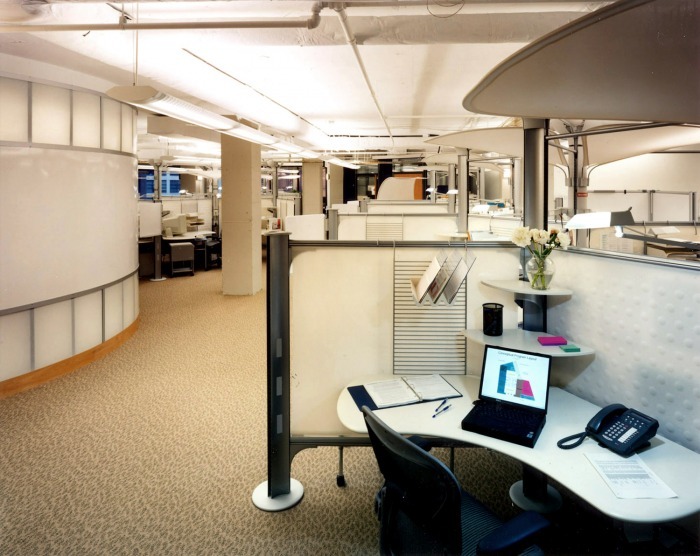 This High-Tech telecommunications company’s corporate offices need to reflect a progressive culture based on open and impromptu communication between staff members. 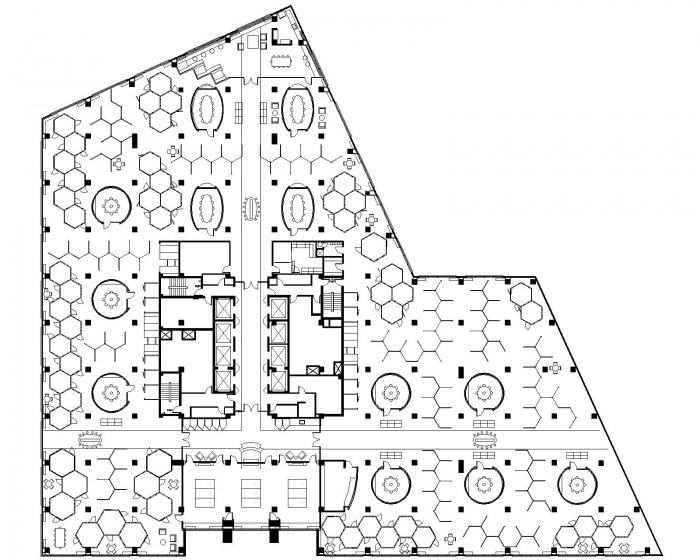 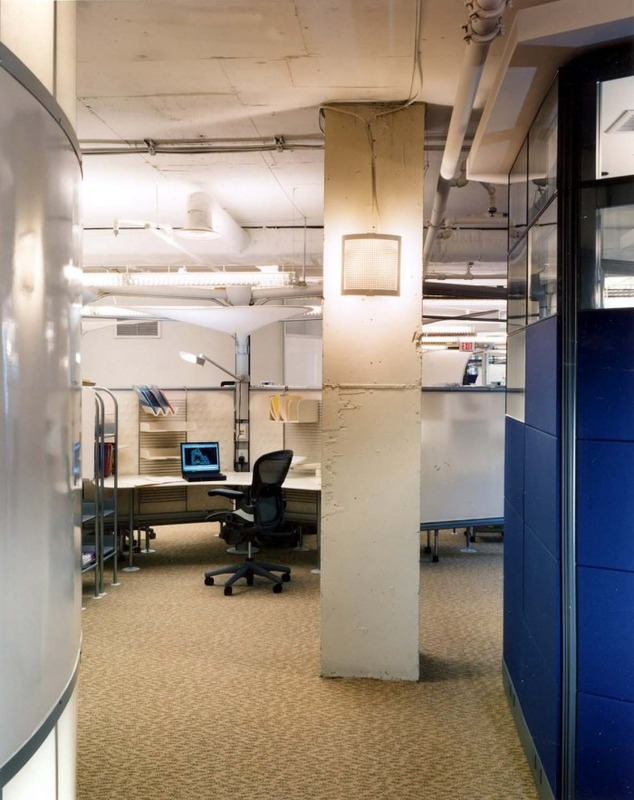 The new space occupies an odd shaped 40,000 SF floor plate with a tight 20 foot column grid. 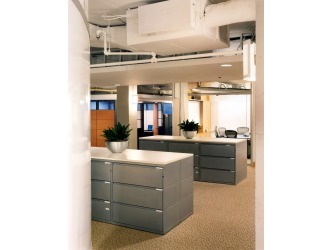 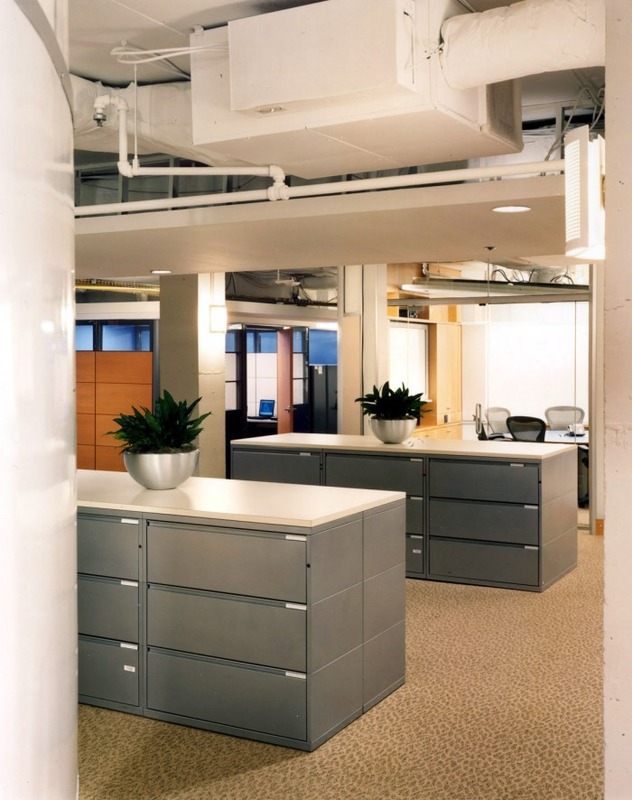 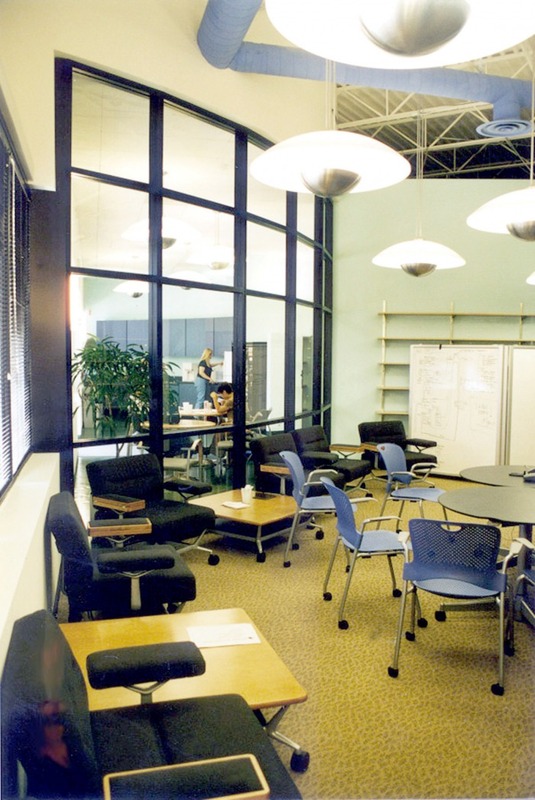 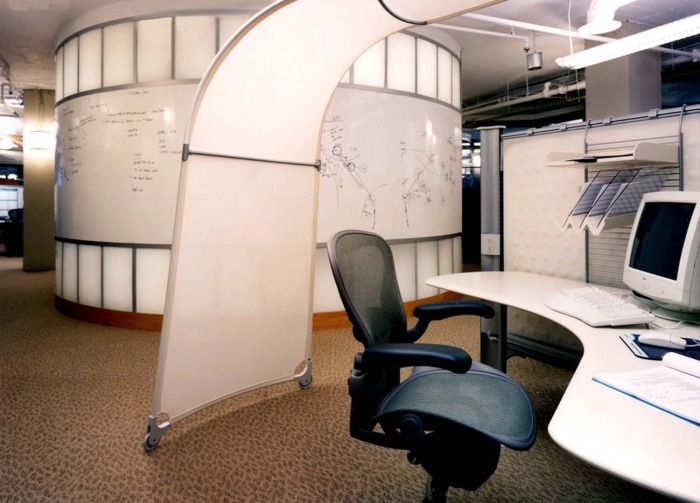 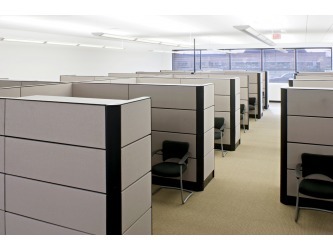 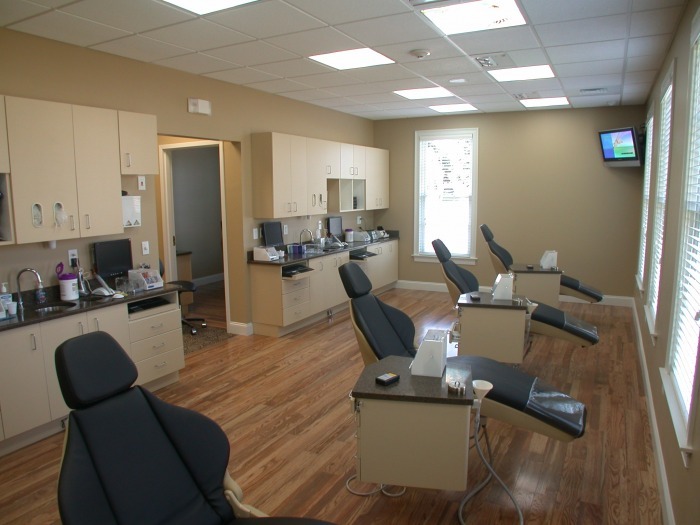 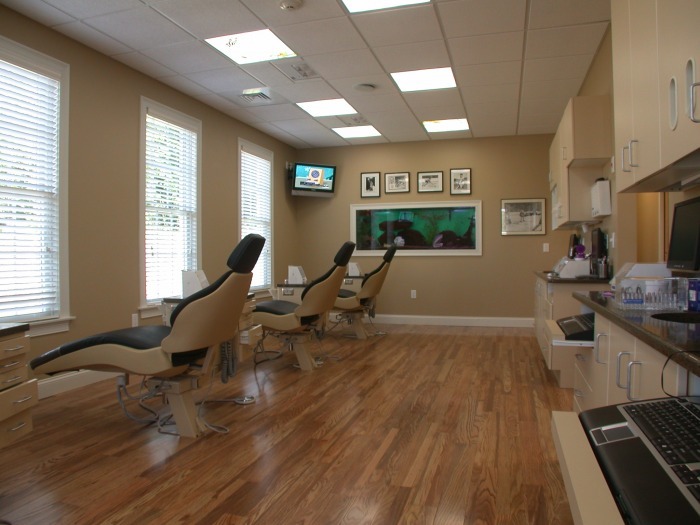 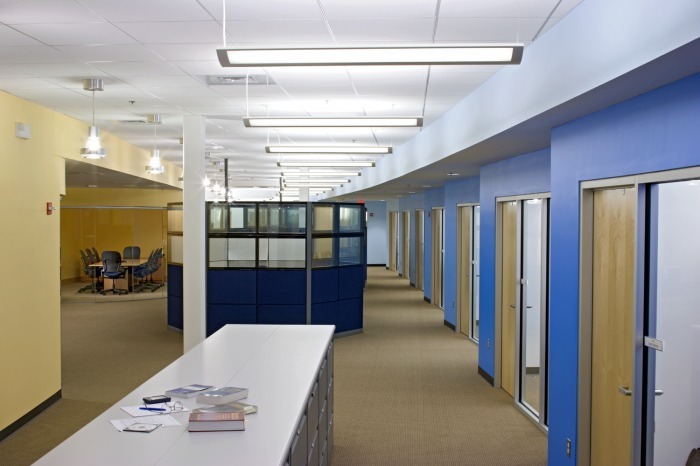 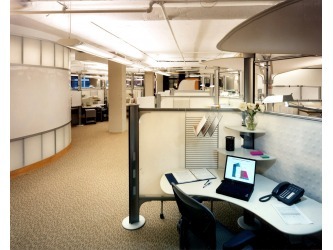 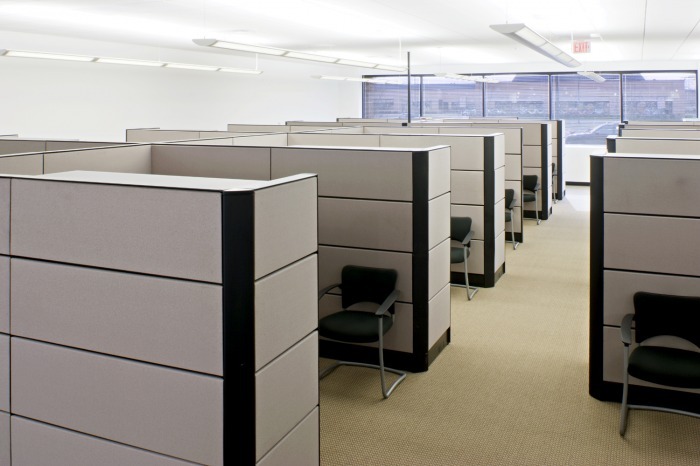 The open plan design solution offers multiple circulation routes through the work stations. 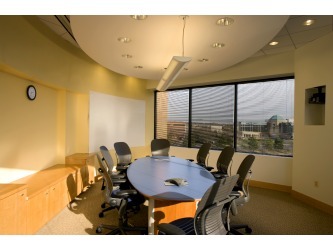 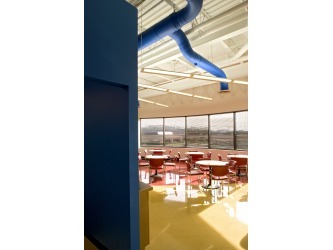 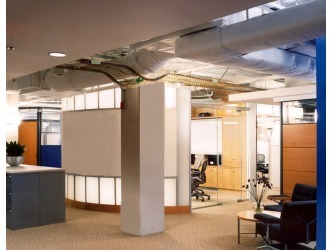 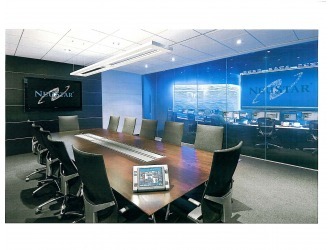 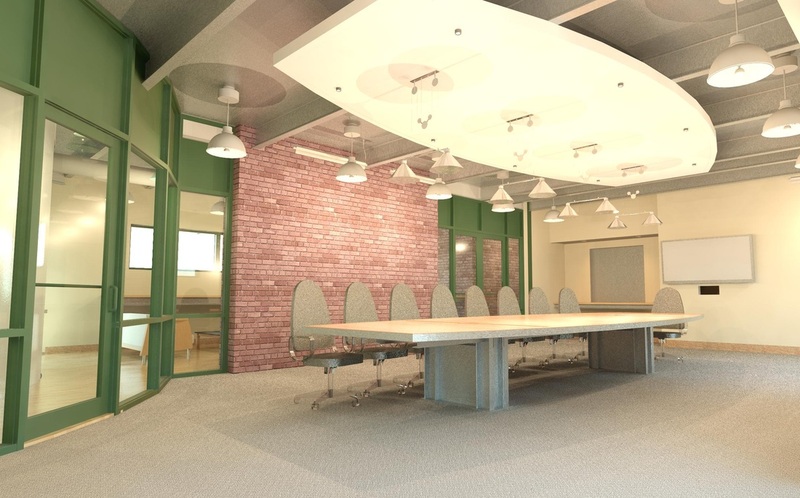 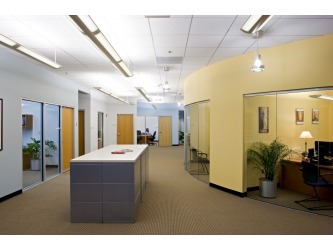 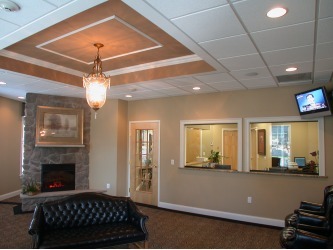 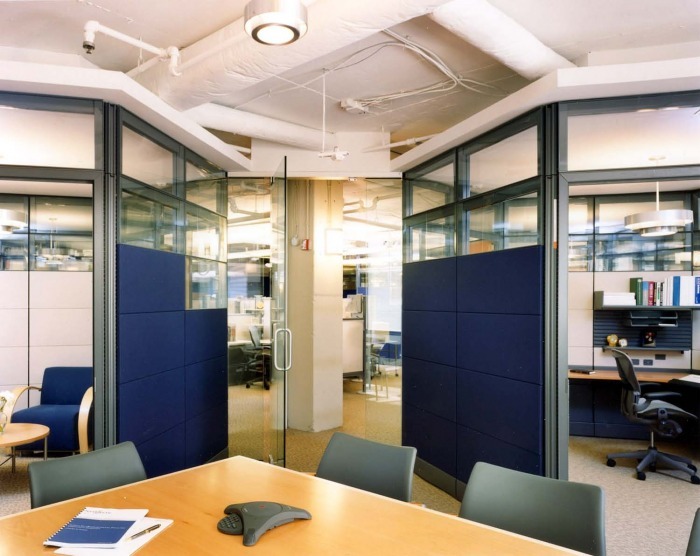 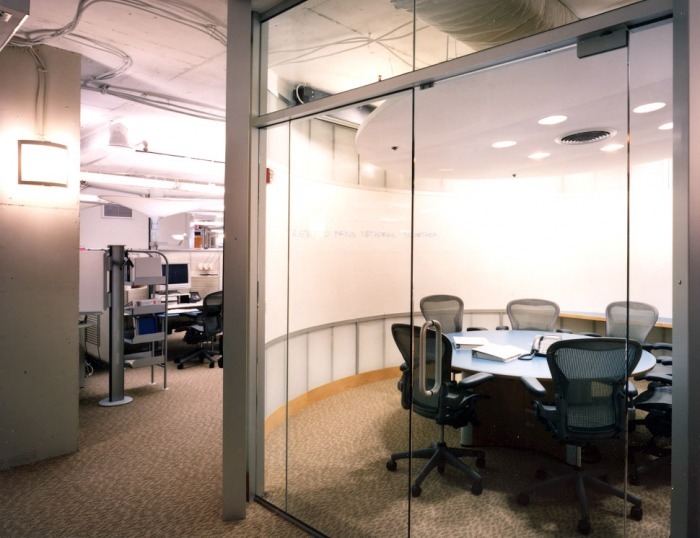 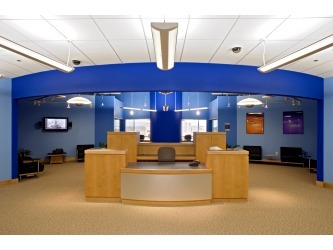 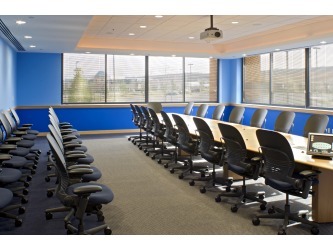 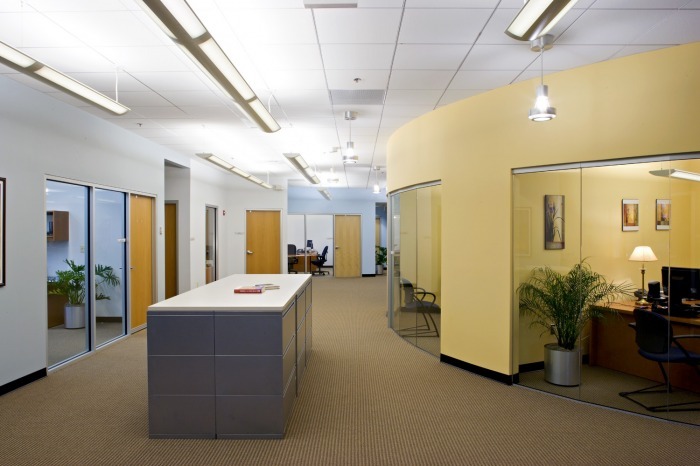 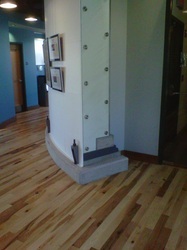 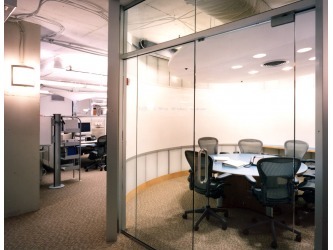 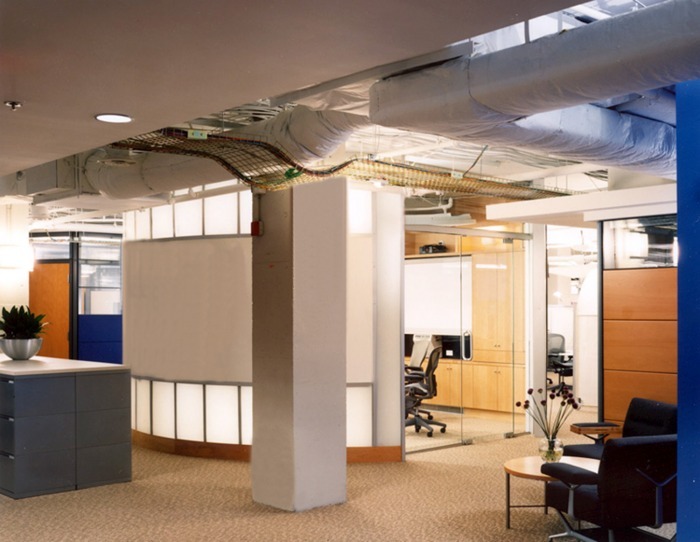 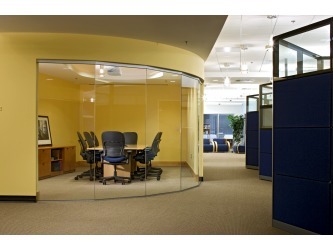 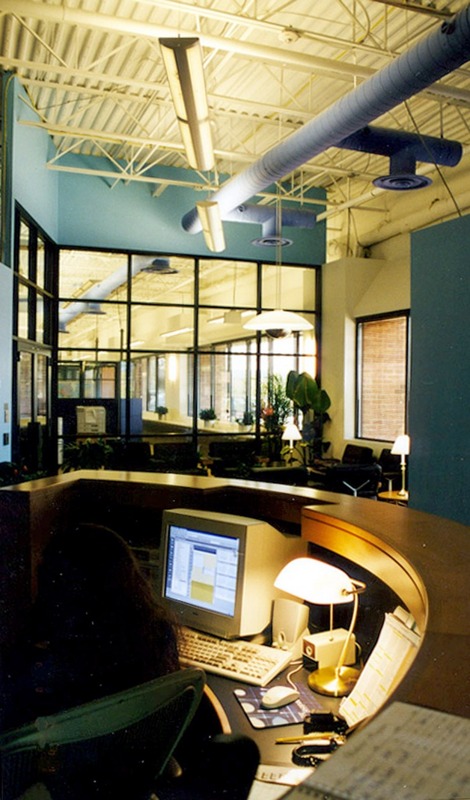 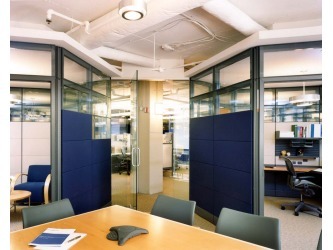 This design also allows easy visual and acoustical access across the entire office. 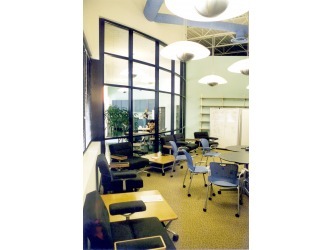 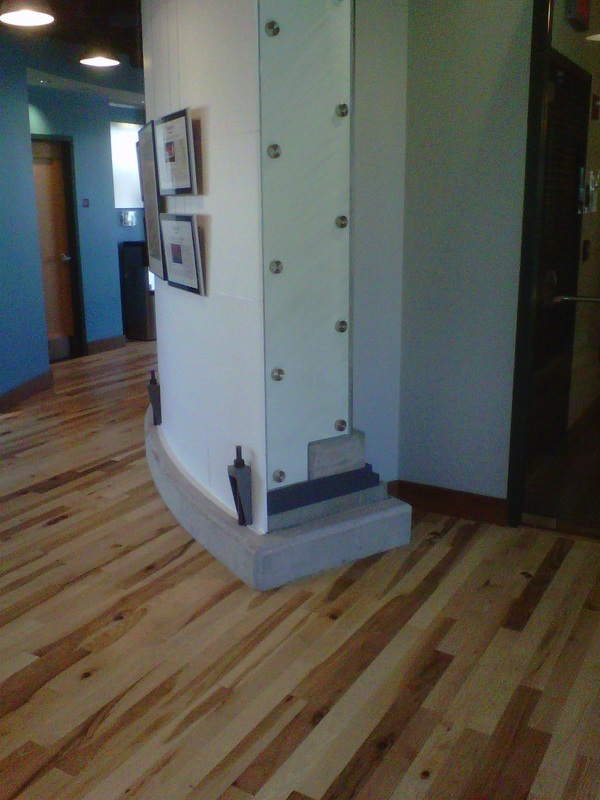 Straight, centrally located circulation axes encourages direct movement and orientation across the floor. 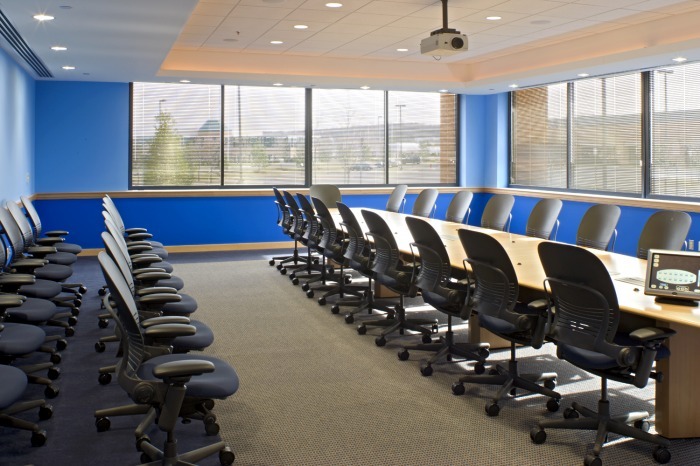 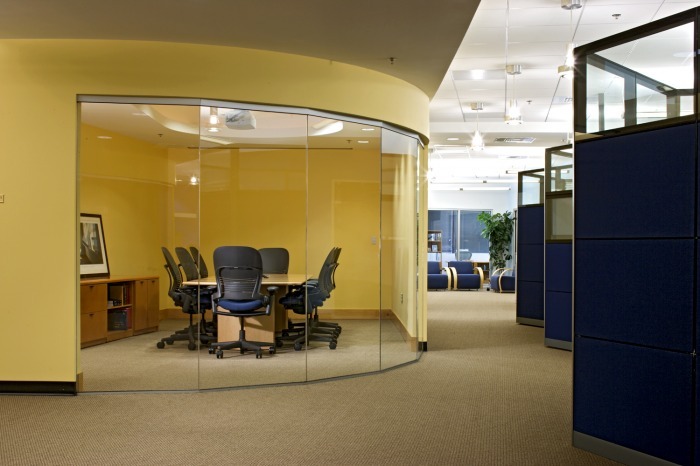 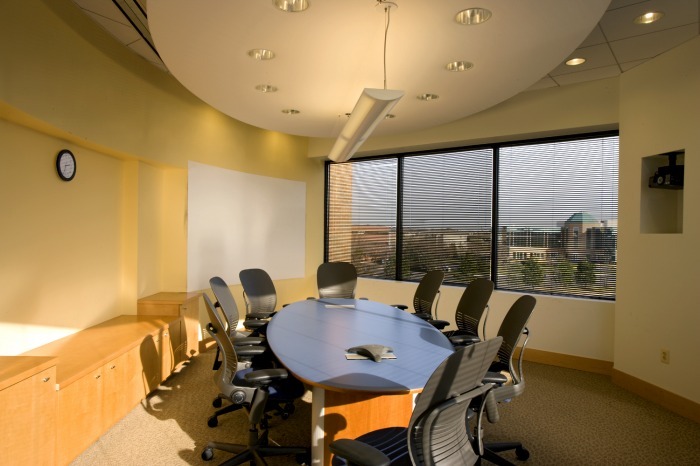 Regularly spaced, glass-walled elliptical and round conference rooms provide the high number of requested conference room seats. 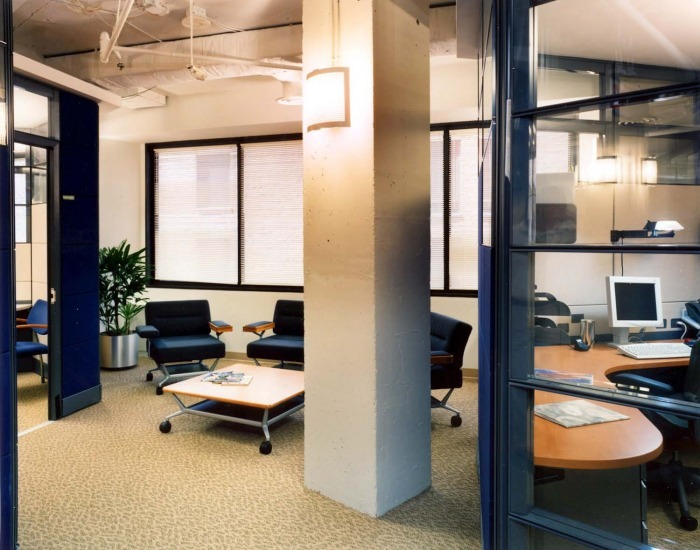 Natural light from perimeter windows penetrates the entire space. 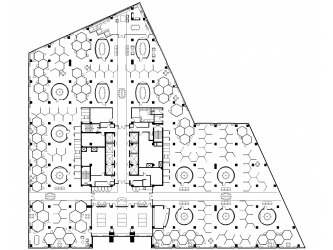 A new hexagonal furniture system readily conforms to the tight geometry of the building, affording maximum efficiency within the irregular wall angles. 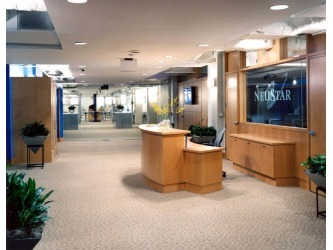 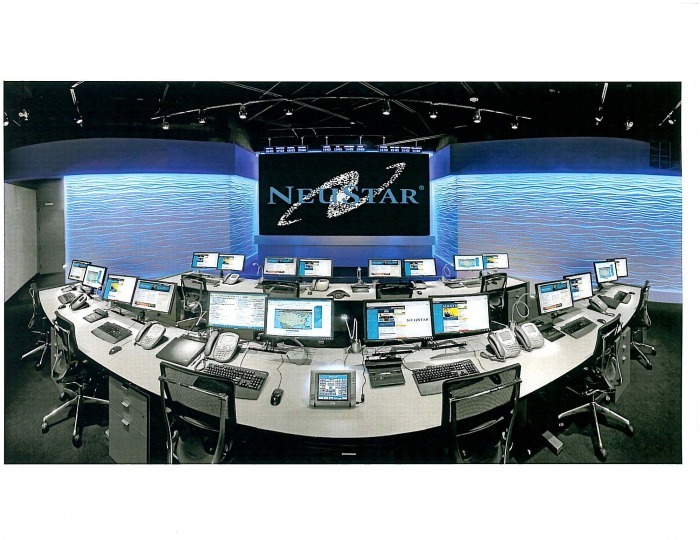 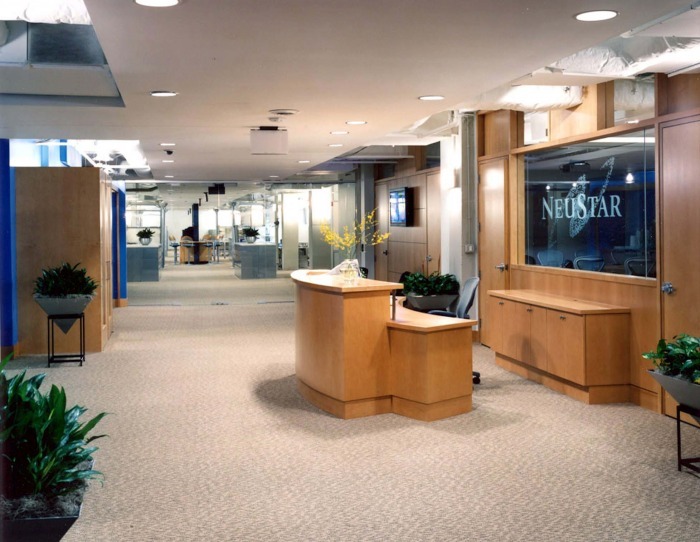 Replicating the open workspace concept established at Corporate Headquarters, the NeuStar International Data Center office floor plan encourages impromptu meetings and the opportunity to cross-pollinate ideas. 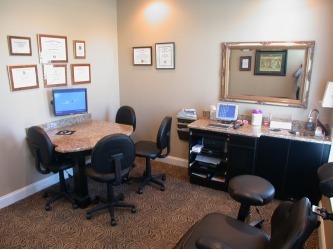 Easy visual and physical access from workstation to workstation is a key component of the design. 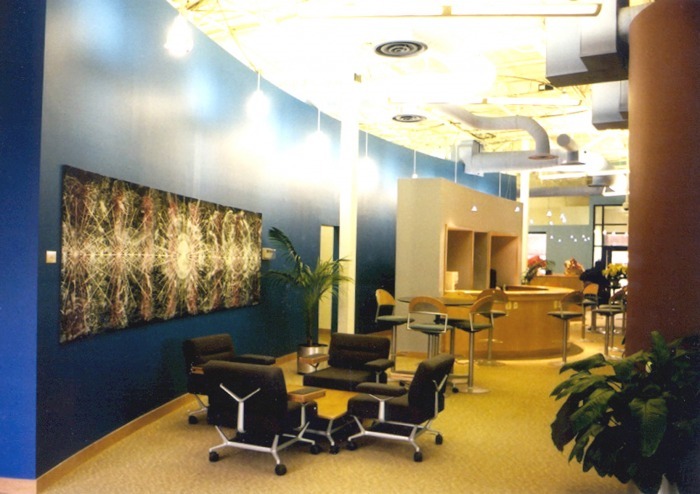 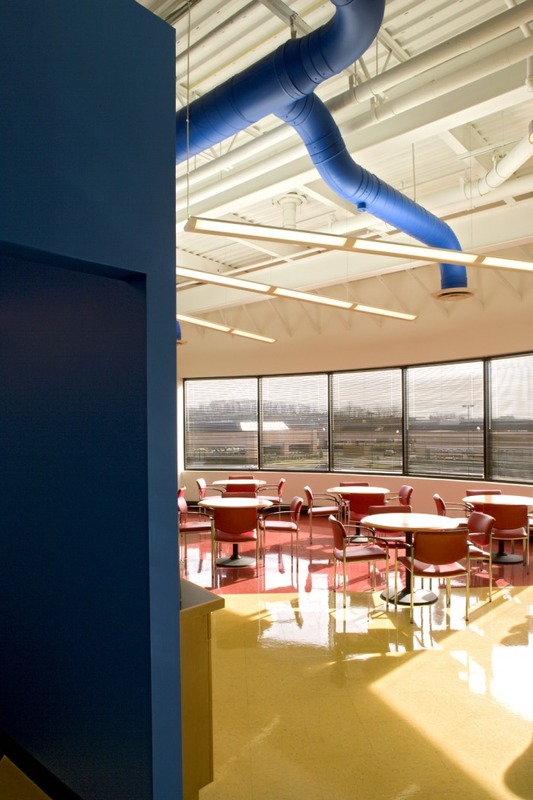 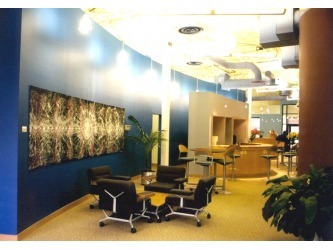 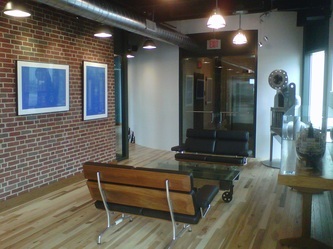 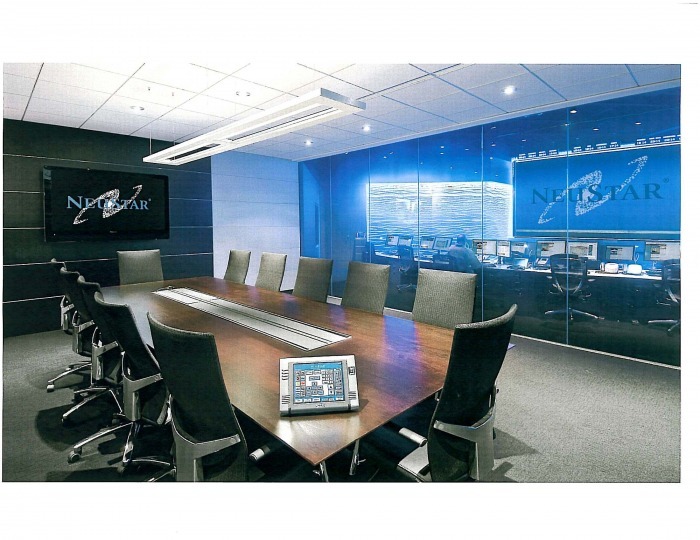 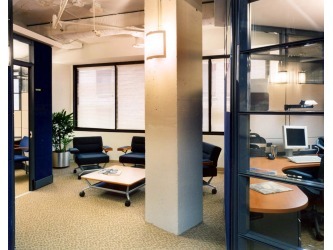 In addition to office areas, this space houses the company’s data and Network Operations Centers. 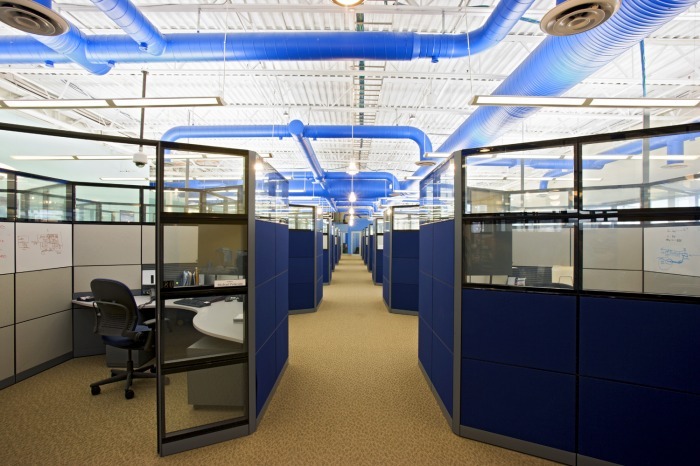 The routers, switches, hubs and UPS systems that comprise the international data network are maintained here. 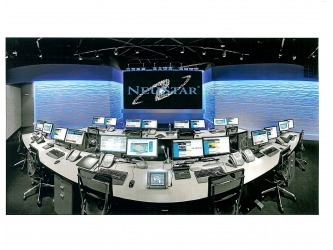 The Center also monitor “.biz, .us, and .cn” internet domain names, among others, worldwide from this location. 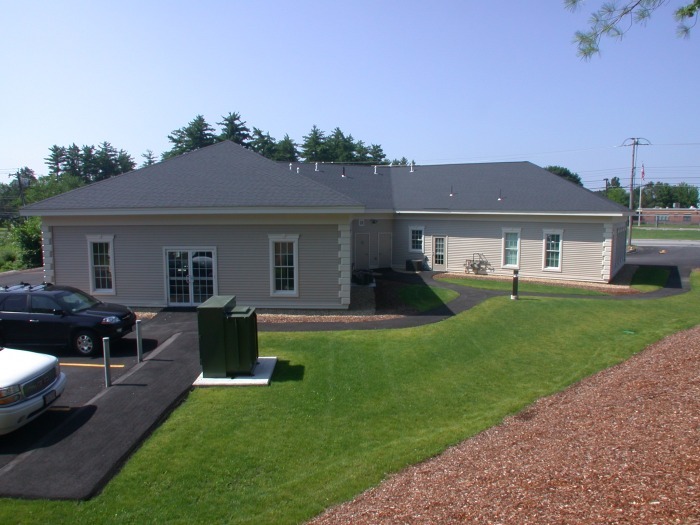 The classic New England details of this newly constructed building blend comfortably with its existing suburban setting. 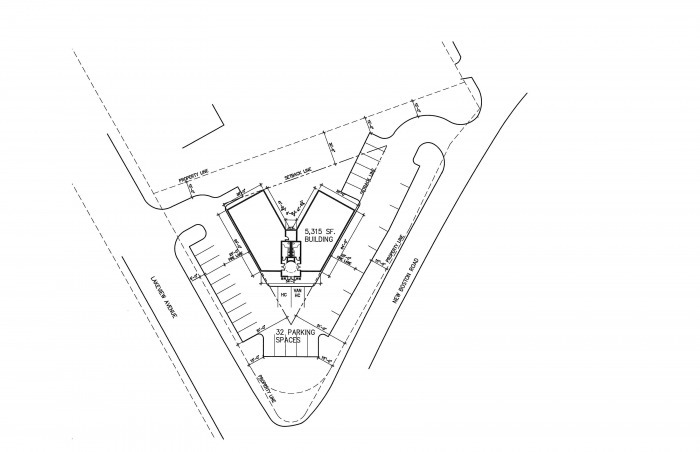 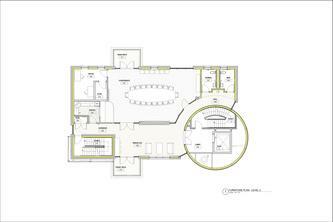 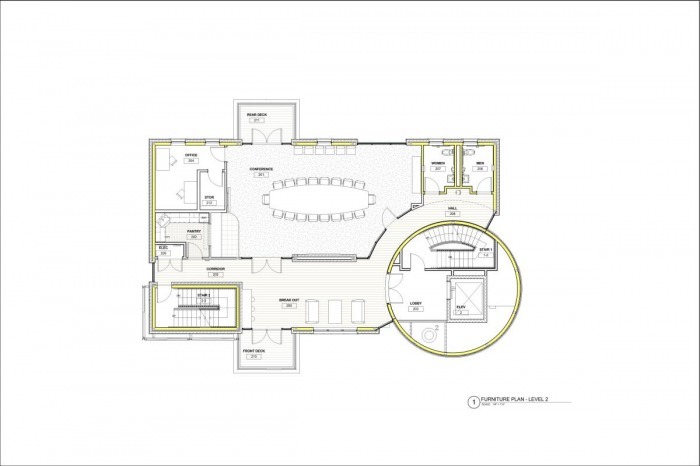 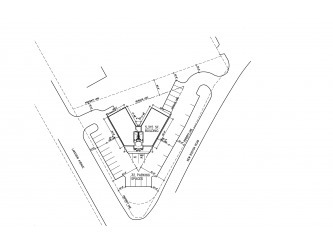 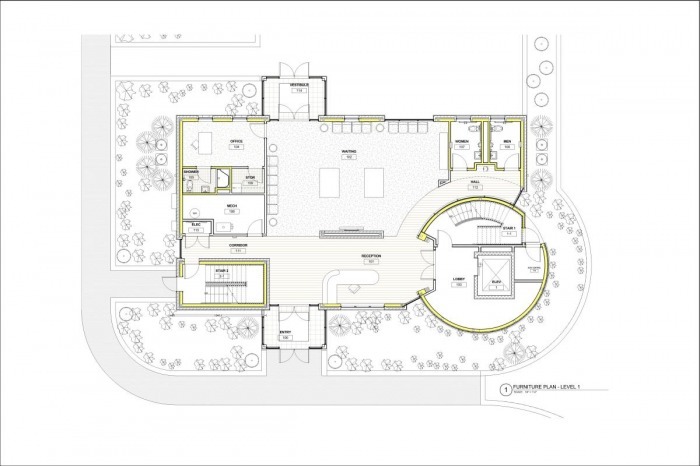 The symmetrical V-shaped plan, provides 2 equal prime tenant spaces both with excellent street frontage and visibility from the busy intersection on which it sits. A proposed 70,000 SF R&D building for the bio-research industry is currently being planned for a site adjacent to the UMass Lowell campus in Lowell, MA .